This is a short post featuring only two birds. I decided it was time to return to Boundary Bay as I hadn't been there in quite a while. I won't say exactly where as it's a no-no to report locations of certain types of birds. However, it's been a month and a half since this visit and the bird of concern is no longer present. The first bird sighted after a short hike south east from the parking area was a Northern Harrier. 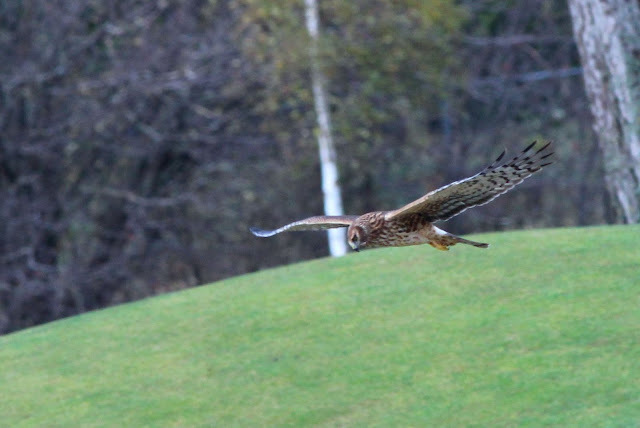 There are numerous species of Harriers in the world, but only the Northern Harrier in North America. It's like a cross between a Hawk and an Owl. Here it is flying over an unidentified golf course. 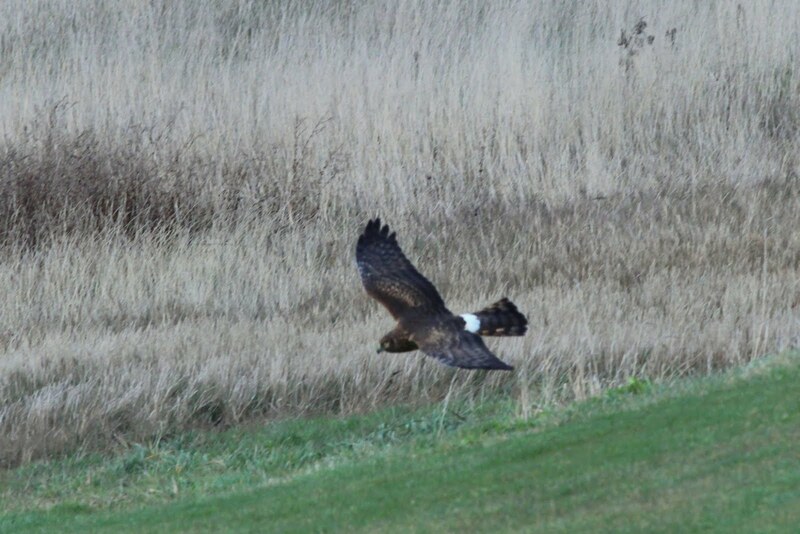 You can always identify a Harrier by the white patch on the rump. This is a female, identified by the brownish colouring. The males are greyish/silver. 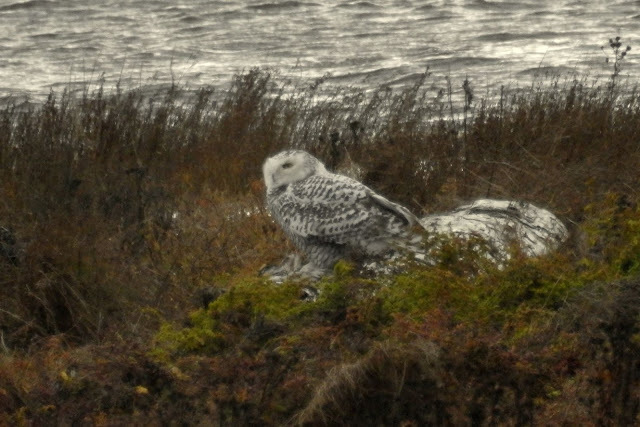 The bird of concern mentioned earlier is the Snowy Owl. When word gets out that they have come down from the north, many people flock to the bay to see them. Some of those people are obsessed with photographing the Owls and will trespass into the wilderness area and harass the owls with no concern for their well-being or their ability to hunt and feed themselves. These photos were all take from over 100 meters distance, so the quality is not great. 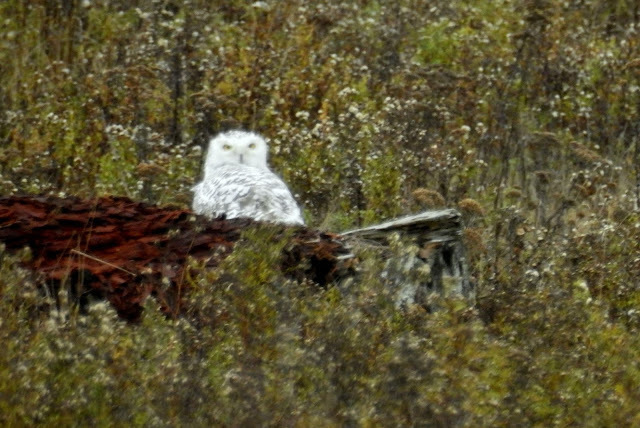 The owl is not longer present at Boundary Bay and no others have shown up this winter. Here's a short video clip of the Owl, it was quite a blustery day.